The launch of The Sacrifice back in July 2018 was the last Mainline update to go out, and it was no doubt a hefty one. There was much for the entire DE team to comb through and we find this to be the case with all Mainlines. As we say with all Mainlines, we can’t catch everything that may fall through the cracks, and even with all of the PC hotfixes that went live prior to the release of this update, there is a possibility you may see some WIP or unintentional things that are not meant to be live. A new type of challenge is available to players that have completed the entire Solar Map! If you have not completed the entire Solar Map, you can go to the Arbiters of Hexis Enclave in any Relay and talk to the NPC located at the front of the room. They will tell you what nodes in the Star Chart you must complete to unlock Arbitrations! ARBITRATIONS are here, read on to learn everything you need to know! Vigorous Swap will deactivate when an Ability weapon is active (Mesa’s Peacemaker, Valkyr’s Hysteria, etc). Arbitration exclusive Resource known as ‘VITUS ESSENCE’ used for crafting Arbitration Cosmetics! Note: Failure is a rare thing in Warframe. Prepare yourself for a new reality where failure may become the norm for these missions – can you overcome the odds!? Find both these new weapons in the in-game Market or in your Clan Research! Find both these new weapon Skins in the in-game Market! Plague Star is returning to XB1 on November 2nd at 2PM ET! A forum thread will be posted when the Operation goes live with all the information you need to burst that boil out in the Plains of Eidolon. Added ability to swap your A B C Appearance loadout order in the Arsenal! The Gear Spiral restricts duplicate Gear items (Apothics, Stims), with the exception of Dragon Keys! Added an ‘Auto Install’ button to the Ayatan Sculptures screen for Mastery Rank 10+ Tenno! This long requested feature allows you to auto install Stars from your Inventory to your Ayatan Sculpture in a flash. Added new aiming in/out transition sounds for Archwing weapons. We added these for primaries and secondaries in 22.17.0, but now you get to hear them in SPACE! There is a fixed Day 5 Reward of 25,000 Credits and 1000 Endo. We recently made the surprising discovery that Miasma’s damage multiplier for targets affected by Spores never fully worked as intended. It has been fixed and will now work as we’ve intended it to originally. That said, seeing as it has been absent until now, we have increased the damage multiplier from 2x to 4x to encourage use of the synergy between the two abilities. Spores scaling Damage cap per second has been reduced from 10 to 7. As always, we watch for your feedback and encourage you thoroughly test out the changes first before leaving your thoughts on the official Warframe forums. Thank you! Fixed Ability immune enemies not decreasing the Mesmer Skin count when hitting Revenant. Fixed Revenant’s Thrall FX not attaching properly to Vomvalysts. Improved visibility of the room rotate button in the Dojo Architect menu, and added shortcut indicators. Since we reverted the Operator Suit Mesh Changes introduced in PC Update 23.10.0 to restore Operator Suit Meshes to their pre-Update 23.10 state, they will not be coming in this update. A more careful re-release of the Operator Suit Mesh Changes will come at a later date. Expand spoilers below for list! We no longer force double-selection to equip Arcanes. Changed D-Pad icons to a solid button shape. Added quick button for the Invite Button on the Invite Player screen. Option can still be selected with the virtual cursor if desired. Icon callouts will now be displayed for currently bound actions when changing bindings. Fixed missing button callouts when placing decorations in the Dojo. Fixed attempting to place decorations in Dojo by selecting the “Decorate” option doing nothing. Fixed virtual cursor not highlighting options in the Dojo Room Options window, making it unselectable. Fixed terms and policies text and Start button under the Warframe logo on login screen being incorrectly positioned. Fixed being unable to select Warframes after purchasing a few Warframes consecutively. Fixed being unable to move virtual cursor with the D-Pad or use most quick buttons while searching for an item in your inventory using the on screen keyboard. Fixed an issue where a list would ‘snap back to top’ when scrolling. Fixed using the tutorial button in the Upgrade menu in the Arsenal incorrectly showing combos instead of the Modding tutorial. Fixed being unable to back out of the Market after opening chat and selecting an item. Fixed customizing your Operator causing them to spin. Fixed being unable to select the Taveuni node on the Kuva Fortress if highlighting the text with the virtual cursor. Fixed issue where two virtual cursors appeared when players selected their first Warframe. Removed Titania’s Razorwing collision damage. Energy, Health, Shield and Ammo restores have a new look! Their refreshed look helps them visually indicate what they restore, with an added range ring to indicate if you’re in close enough proximity to the Restore. Adjusted chances for Kavats to use the Pet Bed to prevent unrealistic bed usage. We refactored the Locomotion system (which is the code that controls how AI find their way around the level) – primarily to allow us to have AI switch between different movement modes (eg walking & flying). We continue to improve on issues of AI behavior struggling in certain scenarios since this was first noticed on PC in Update 23.10.0. Investigations continue into other reports and will be addressed overtime. Tweaked the Incubus Syandana to rest in the mouth on the back of the Nezha Empyrean Skin. 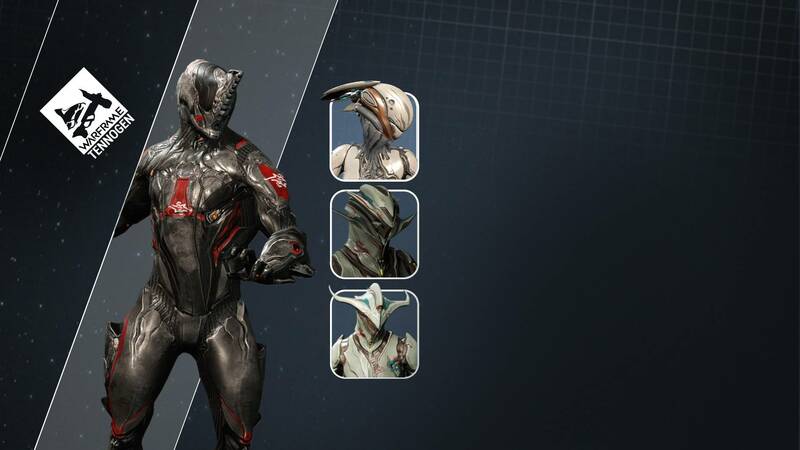 Updated theme texture icons for all Warframe Skins/Helmets for Ash, Atlas, Banshee, Chroma, Ember and Equinox. Fixed the Obsidian Corvus Sigil appearing much lighter in colour than other Obsidian items. Fixed buffs/debuffs permanently stacking on Zaws after activating and deactivating Titania’s Archwing. A common result was melee speed getting slower and slower. Fixed an issue where Adaptive Exposure would randomly turn everything black. Fixed transference prompt not appearing during The War Within Quest, halting progress. Fixed Mirage’s Hall of Mirrors with very low Duration on laggy Clients possibly causing perpetual ‘ABILITY IN USE’. Fixed Nyx’s Chaos Sphere Augment not always grabbing every enemy in its radius. Fixed ranking up Octavia’s Conductor Augment not actually increasing the speed of Resonator. Fixed seeing 2 different Energy colors when casting Chroma’s Spectral Scream. Fixed Warframe Abilities affecting Dargyns (Chroma’s Elemental Ward) when an ally has mounted it. Fixed casting Mesa’s Peacemaker Ability unintentionally refreshing the Arca Scisco buff, but not actually increasing the Critical Chance. Casting Mesa’s Peacemaker Ability should not activate/refresh the Arca Scisco buff . Fixed Gara’s Splinter Storm ability breaking Corpus reinforced glass. Fixed Archwing being deployable in the Simulacrum. Fixed Maroo’s Bazaar minimap being disconnected. Fixed Players not appearing online when you’re waiting for them in the Friends or Clan lists. Fixed cave doors not opening when playing a Sortie mission in the Plains. Fixed a level hole on Lua. Fixed level hole that would allow players to leave the map in the Grineer Fortress tileset. Fixed Dojo MOTD not indicating that a Herald Role is required to edit. Fixed the True Punishment Mod missing its description. Fixed Trinity Prime’s skirt appearing wonky. Fixed Nyx’s Chaos illusions’ Syandanas not applying the chosen Energy colour. Fixed some TennoGen Helmet’s missing their Icons in the Inventory screen. Fixed Frost’s Ice Wave ability causing performance problems/crashes when cast into a wall/above a large pit right when choosing a reward in a Void Fissure mission. Fixed a script error when switching loadouts in the Arsenal > Upgrade screen. Fixed a rare case of Plains session timing out. XB1 Chimera: Update 23.10.6 (In Cert!) Operation: Plague Star Returns to XB1!